After a two-hour flight from Toronto and I find myself on the islands of South-West Florida. Known as Captiva, Sanibel, and Cabbage Key, these islands encircle central Fort Myers where long white sandy beaches await laid-back, sun-seekers like me. After a two-hour flight from Toronto and I find myself on the islands of South-West Florida. 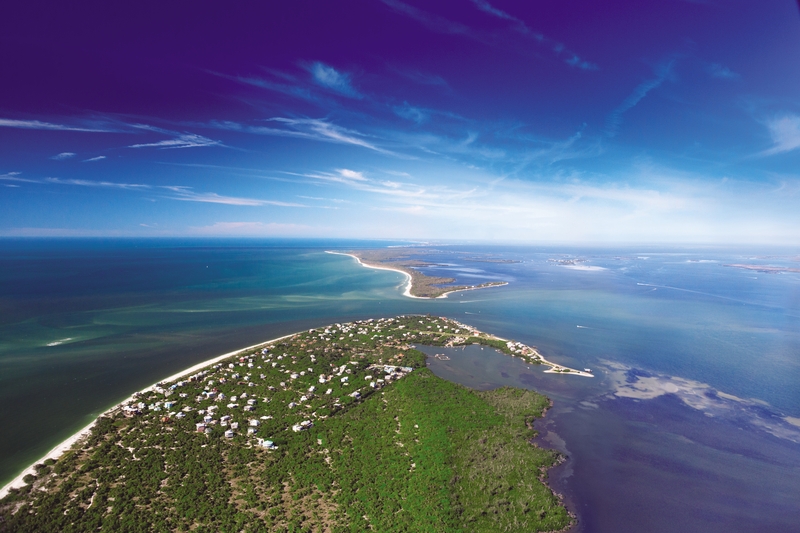 Known as Captiva, Sanibel, and Cabbage Key, these islands encircle central Fort Myers where long white sandy beaches await laid-back, sun-seekers like me. Rich with natural beauty and legendary tales of pirates, poets, and naturists, I set out to explore the region's best in island hopping adventures. For this trip I had one mission: to see a wild, live dolphin swimming in the ocean. And a tour with Captiva Cruises en route to the tiny island of Cabbage Key was my chance to do it. I board the Lady Chadwick and immediately begin pressing the guide for dolphin details. "They aren't scared of boats at all," he tells me. "They're really social animals. In fact, if you holler and cheer for 'em, they'll put on a little show". Moments later he announces that a group of dolphins are racing towards the boat's port side sending me a runnin' and a hollerin' to meet them. Now alongside the boat, the pod obliges us in their game of jumping and diving with incredible speed as passengers cheer them on. Mission accomplished. 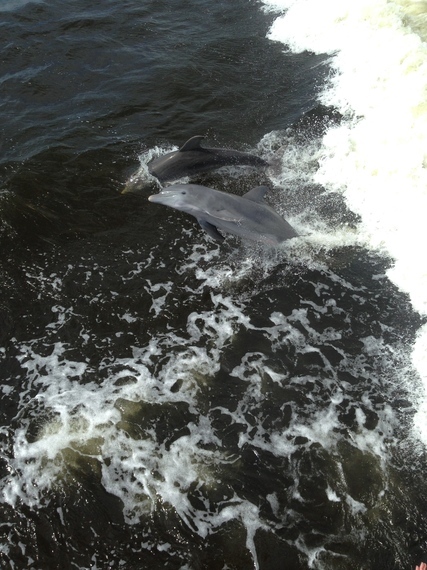 I'm still reeling from my dolphin encounter when we dock on the island of Cabbage Key. Once a private island it is now home to the Cabbage Key Island Restaurant and Bar. 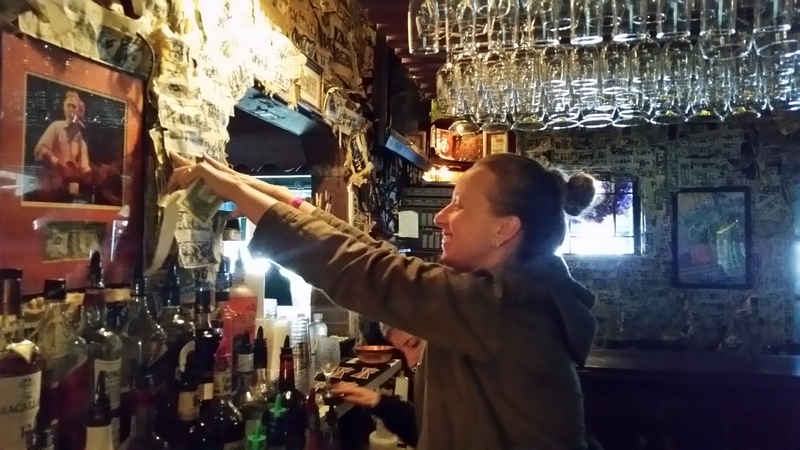 Here the ceilings and walls are dripping with one-dollar bills affixed by patrons keeping up a local tradition. As the legend goes, fisherman would a sign and stick a bill to the wall before setting sail as pre-payment for a drink on their return. These days the walls are lined with some $70,000 dollars in singles signed and scribbled on by guests like Jimmy Buffett and now, me. I order a grouper fish burger, a slice of their frozen key lime pie, and set about defacing Washington's face with a black sharpie. You can find it behind the bar. A short drive from, Fort Myers over the arching causeway and I've got my toes in the sand on Sanibel Island. Home of the highly photographed Sanibel Lighthouse, this is where I will try my hand at shelling. A popular activity among locals and tourist, shellers come here to comb the sand of Bowman's beach in search of exotic seashells. Like you, I was sure that shelling would be a bore. It wasn't. Sea breeze, warm sun, and soft sand went perfectly with this utterly calming activity. I walked with my feet in the ocean scanning the beach distracted only by massive pelicans flying mere inches above the water. And while I didn't find a Triton's Trumpet or Lion's Paw, I did line my pockets with a few Lightening Whelks. A little further down the 4-mile tour loop, we see a group of large tropical birds nibbling at bugs on the shoreline--a rare treat, I'm told. Our guide's excitement reaches its crescendo as a candyfloss coloured Roseate Spoonbill takes to the air in a flurry of vibrant pink feathers. Ready to eat and unwind I head off of Sanibel to Captiva Island for the last stop on my island hopping tour: the mind-bending Bubble Room. Here the 1930s kitsch and Hollywood memorabilia is outdone only by the portion sizes. Massive fruity cocktails and platter-sized dishes are served-up by enthusiastic staff whirling under colourful bubbling holiday lights. A toy train runs through the labyrinth of pink dining rooms and bars each decked out with toys, posters, and antiques. 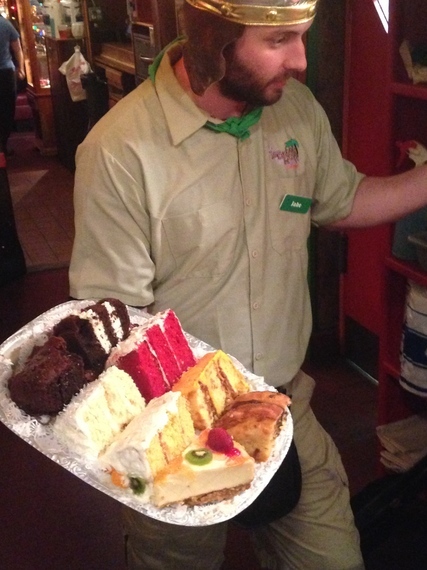 My fast talking waiter lights fiery flambés and dishes out massive entrees like the 9oz Charlie Chaplin Pork Chops and the 16oz Dem Bones T-Bone steak.